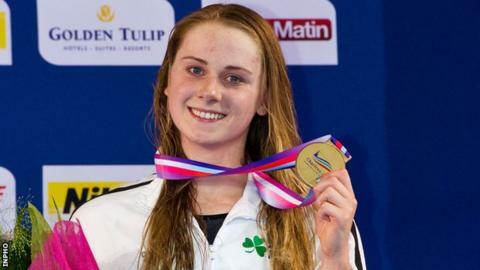 Twice European Championship medallist Sycerika McMahon has announced her retirement from competitive swimming at the age of 22. The Portaferry woman won two European gold medals in an outstanding junior career before landing silver and bronze medals at senior level in 2012. McMahon also competed at the London Olympics in 2012 but has struggled for form in recent seasons. "This was an unexpected and difficult choice," said McMahon on Tuesday. "It is not easy to give up something that you have done your whole life. "My sport took me to some unimaginable highs and it's been an honour for me to represent my country all over the world. "I will always cherish the unforgettable memories I have from my career, as well as the friendships I made along the way." McMahon set a host of Irish records across a range of events and distances but she acknowledged in her retirement announcement that she felt "I was capable of a lot more". "Regardless, I would like to say a huge thank you to everyone who has been involved in helping me reach my goals over the years. "I wouldn't have been able to live out my dream as an Olympian or take up a scholarship in the USA without you all." After winning European junior medals in 2010 and 2011, McMahon won 50m breaststroke silver at the European Senior Championships in Hungary in 2012. Later that year, the Northern Irishwoman won a European short course bronze medal. McMahon went into the 2014 Commonwealth Games with high hopes of challenging for medals but struggled in Glasgow and she missed out on qualification for the Rio Olympics last year.